DUI Attorney | Jimeno & Gray A. P.
Hiring a lawyer may be the most important decision you make in your DWI or DUI case, and there are plenty of attorneys out there competing for your attention. But the reality is that you shouldn’t trust just any DWI or DUI lawyer when it’s your freedom, your money and your life on the line. At Jimeno & Gray, P.A., our Annapolis DUI lawyers have extensive backgrounds working in Maryland’s criminal justice system, both as prosecutors and criminal defense attorneys, and we don’t take on DUI and DWI cases just to settle them. We understand that there is pressure right after a DUI arrest to handle it as quickly as possible, but our job is to fight convictions and seek the best possible outcomes for our clients in the long run. We look past the easy plea to the consequences you may face from having a DWI or DUI conviction on your record — such as disclosing your conviction to future employers and anyone else who wants to research your background on the Internet. If you require DUI help in Annapolis, Glen Burnie or anywhere in Anne Arundel County, the decision you make next could shape your future for years to come. Contact Jimeno & Gray, P.A., today to talk to an experienced Glen Burnie DUI lawyer and begin building your best defense. When you’ve been arrested on a DUI or DWI charge, you may feel trapped and doomed to an automatic conviction. Do not give up without a fight. A good criminal defense DUI attorney knows where to look for weak spots in your case and how to counter the prosecution’s story. Has the defense attorney also been a prosecutor? DWI and DUI prosecutors spend countless hours preparing for trial and litigating these types of cases in court. This preparation, as well as private conversations with police officers, gives prosecutors access to information that many defense attorneys do not get to see — such as watching the planning and execution of field sobriety checkpoints. As a prosecutor, you read thousands of DWI and DUI police reports. With experience, reading these reports becomes more about what is left out rather than what is actually in them. For example, officers can take notes on hundreds of small details from the time they see you driving your car until the time they serve you with your paperwork after you are arrested. If these observations are not in the police report, they did not happen. Has the DUI lawyer been trained to conduct standardized field sobriety tests? The best way to understand field sobriety tests is to literally sit in a police academy and take the 40-hour class alongside new police recruits. By completing this training, an attorney gets to see how officers are taught to administer the tests, record their observations and later testify in court. DUI lawyers who lack this training can get eaten alive during trials by experienced police officers. The Annapolis and Glen Burnie DUI attorneys at Jimeno & Gray, P.A., are equipped with this type of training, and we are prepared to go head-to-head with a police officer in court over your field sobriety test. Has the DWI lawyer taught classes for new police recruits or other lawyers about handling cases? Being asked by prosecutors, officers who run police academies, and professional legal associations to train others is a reflection of an attorney’s solid reputation. 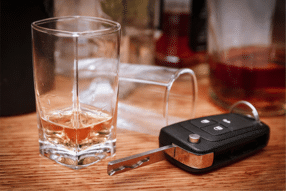 The DWI lawyers at Jimeno & Gray, P.A., are asked to train our peers and other professionals because we have years of experience handling these types of cases. When it comes to hiring an attorney to handle your DWI defense, you deserve to be represented by the one who is teaching the class, not the one who is sitting in it. Does the attorney have experience actually trying cases? Beware: Any lawyer can go to court and enter a guilty plea for you. The DUI lawyers at Jimeno & Gray, P.A., have years of experience fighting DUI and DWI charges in the courtroom. When we take your case to trial, we will be ready to do battle. Is the DUI lawyer you interview with the one who will come to court with you? At some firms, you may meet with the experienced partner at the initial consultation, but then an inexperienced associate shows up to represent you in court. Don’t fall for the bait and switch. At Jimeno & Gray, P.A., you can trust that our experienced and knowledgeable DUI attorneys will see your case through from beginning to end. Is the lawyer asking how much money another lawyer quoted you to handle your case? Retaining an attorney to handle your DWI case shouldn’t be like buying a used car. This is your life on the line. DWI lawyers who try to undercut other lawyers often rely on having a high volume of cases and may not have a lot of time to spend on your case. At Jimeno & Gray, P.A., we charge a fee that reflects the amount of time and effort we will put into your case to provide a vigorous DWI defense. Simply put, you get what you pay for. In the state of Maryland, you can be charged with either driving under the influence (DUI) or driving while impaired (DWI). The amount you have had to drink will ultimately determine which charges are brought against you. The DUI charge is more severe. 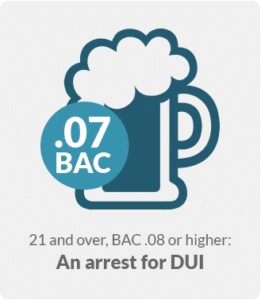 In order to receive a DUI, you must have a blood alcohol level (BAC) of at least .08. The DWI charge is reserved for more minor infractions. 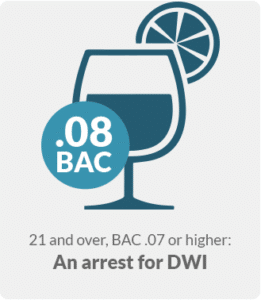 You need to have a BAC of .07 to receive a DWI. The consequences for a DUI are a little more harsh. You will be fined a maximum of $1,000, receive up to one year in jail, and lose your license for 45 days. For a DWI, you will be fined no more than $500, your jail time won’t exceed two months, and your license will be suspended for a maximum of 60 days. A DUI or DWI conviction will raise your insurance rates as well. Some insurance companies might even cancel your policy when they find out about your conviction. A DUI charge is very serious and will stay with you for the rest of your life. It is very important that you hire an experienced DUI attorney to help you through this ordeal. A skilled lawyer can help reduce your charges and penalties, and in some cases even get you an acquittal. At Jimeno & Gray, we have been specializing in DUI cases for years, dating back to our time as prosecutors in the district attorney’s office. We know these cases inside out, and we understand the strategies used by prosecutors to secure a conviction. We can help minimize the damage caused by your DUI and help you move on with your life. If you have been charged with a DUI in the Annapolis, Baltimore, and Columbia, Maryland area, please contact Jimeno & Gray today to schedule an initial consultation. Whether you are in Glen Burnie, Annapolis, Columbia or anywhere else in Anne Arundel County, our DUI attorneys stand ready to fight for you.